That average attendance drop marked the second-sharpest decline since the NCAA began keeping track of college football attendance in 1948. For the first time in history, average attendance declined nationally for four consecutive seasons. The 2017 numbers include FBS home games, neutral-site games, bowl games and the College Football Playoff. Since establishing an all-time high average attendance in 2008 (46,971), FBS attendance has slipped a record 10.1 percent over the last nine years. Even the most rabid league in the country saw a dip. In 2017, the SEC experienced its sharpest per-game decline -- down an average 2,433 fans -- since 1992. That figure led the Power Five in fans lost per game in 2017. College sports has long been at odds with how to manage the time/value relationship. In other words, how to make attendance at a live event more valuable than the alternatives, which range from remaining at a tailgate outside the venue to viewing on a smartphone while on the go to watching in the comfort of one's living room. "It's a technology issue," said Wright Waters, Football Bowl Association executive director and former Sun Belt commissioner. "The public is ahead of us every day in what they can get from technology. We have not been able to keep up." One former Power Five athletic director called it a "societal shift" leading the powers that be scrambling to figure out the viewing habits of millennials as well as well-heeled alumni. "This is not surprising to me," said Bill Lutzen, a veteran sports TV programmer who is currently the CFO of a web optimization firm. "This issue is with lack of involvement of the college students. They no longer view attending sporting events as part of the university experience." Despite leading the nation in average attendance each year since 1997, Michigan has had issues recently selling student tickets. One Power Five source suggested the NFL and MLB have been much more proactive in downsizing stadiums to create a more premium ticket. Arizona State, Kentucky, North Carolina and Penn State are all in the process of downsizing stadiums. In marketing circles, that creates a more intimate experience. Marketers continue to struggle to find a successful balance in stadiums. Across all leagues, that means making the game experience as close to that living room experience as possible. AT&T Stadium in Arlington, Texas, and Mercedes-Benz Stadium in Atlanta have created in-house lounges so extravagant it's actually better watching on a cinema-quality screen with drink in hand than stepping out to view the real thing a few feet away. "Does the experience and cost outweigh the convenience of watching it at home?" asked Brian Cockerham, vice president of PrimeSport, which sells travel and ticket packages to pro and college events. "That is why you are seeing several schools decrease capacity and [others] look to decrease capacity and look to increase the experience and amenities." Some of the slippage nationally can be attributed to the growth of the FBS. In recent years, FCS schools with smaller fan bases and stadiums have moved up to FBS. Since 1988, Division I-A/FBS has grown by almost a quarter from 104 schools to 129 in 2018. Example: Georgia Southern last year drew a hurricane-impacted crowd of 3,387 vs. New Hampshire. But across all divisions, 1,693,661 fewer fans attended games in 2017 compared to 2016. That's the biggest per-year drop since 2004. Although the average decline for FBS, FCS, Divisions II and III was only 380 fewer fans per game, that marks the sharpest year-over-year drop since 1993. Bowl game attendance also declined for the seventh straight year to an average of 40,506 in the 40 games. That marks a 23 percent drop-off in average bowl attendance since 2010. "Are we concerned about it?" Waters asked. "You're damn right." Waters said a mitigating factor in bowl attendance dip is an expansion in recent years to several smaller venues. The total of 47.6 million fans who attended NCAA football in 2017 is down almost 2.7 million fans (5.3 percent) since an all-time high of 50.3 million in 2013. In fact, there were indicators across the board that fewer fans are paying the price of admission to actually watch games. - Despite an uptick in the number of teams playing NCAA football (666), the total amount of fans (47.6 million) were the fewest since 2005. - In the latest realignment era (since 2012), Power Five conference attendance is down an average aggregate of 11,383 fans per game. Only the SEC is up in average attendance (+128) during that six-year period. - The Pac-12 has experienced the biggest overall drop of any Power Five league: 4,078 fans per game since 2012. Its 2017 average of 49,601 is the conference's lowest average attendance since 2001. - The ACC experienced its lowest average attendance (48,442) since 1999 (45,073). The 2017 figure was the lowest among Power Five conferences for the 13th straight year. - Only the Big Ten and Mountain West had average per-game increases in attendance from 2016. In once again leading FBS in attendance, Michigan (111,589 per game) posted the six largest crowds of 2017. - Purdue had the largest attendance increase (up 13,433 per game) going from 34,451 in 2016 to 47,884 in 2017. The Boilermakers won seven games for the first time since 2011. Fan experience fan experience fan experience... it has been preached for a solid decade & shouted from the mountaintops. I'll readily admit that I don't attend games like I used to in general across multiple sports, because in the competition for my time Texas State is starting to lose. I haven't made a game in a couple years, but now that I'm back in the area I plan to remedy that. That said, now that I'm married with little ones my priorities have changed from shotgunning Keystones and crawling home from the after party at the square to shotgunning Miller Lite and teaching my children how to be a good DD. Priorities and all that. In all seriousness, wasn't there a concerted effort to have some sort of family friendly aspect to tailgating a few years ago? Is that still a thing? I just kind of figured 'what does moose milk taste like?' was in everyone's Google search history somewhere. I think some of it has to do with game times favoring tv over fans attending the games in person. Most mid-week games are poorly attended. Cost has gone up for some schools, tv coverage is more widespread with better quality. I have been attending way more than I used to and made every game the last two years. I think they are fun but I also have a ridiculous bac by the time the game starts. Yep, petting zoo, face painting, inflatable jumpers. My wife and I are fans because we can take turns during the game to bring the 4 and 1 year old for entertainment when they get board. I have wondered all along if we were late to the FBS party. It appears that we may be nearing the downside of the college football game. I believe the end of big-time college football may be a generation or so away. I do believe Texas State University and Texas in general will be one of the last places to maintain college football teams and accompanying marching bands, drill teams, and cheerleaders. I've harped on this for a long time now. Between 1992-2002 13 teams joined FBS, the last large time period of serious G5 contenders including stAte, Boise, UCF, USF and Troy. I was there during that time, and even though we had 25,000 students when I was there, plenty large enough to support an FBS (D-IA) football team, most students didn't even realize our size and the small-school mentality prevailed. Most students complained about the costs even back then. I knew some who felt we should go UTA and be a basketball school but again what is the point of the marching band, Strutters, large sports therapy and related departments without a football team. We are a major teachers college and where do coaches come from? most students didn't even realize our size and the small-school mentality prevailed. school has almost doubled in size since then, yet today the alumni don't realize our size and the small-school mentality prevails. I legitimately wonder if it is the small school mentality or the university's laissez-faire AD. I'd love to say it was clearly the AD, but our alumni stepping up has been an issue before him. Difficult to get people to step up (give their time and money) to a perennial loser. After awhile, it just feels like throwing good money after bad. I put it more on the AD, the laissez-faire attitude, the fact that The University doesn't appear to really care about winning. Winning is the key. Go back to any period (yeah, they're few and far between) when we had a winner on the field ('05 for instance) and it wasn't hard to find people "stepping up" as you put it. Plenty of butts in seats during that play off run. Plenty of interest when the program's winning. The problem is sustained winning . . . we just don't do it . . and interest wains . . . I get that, and I agree. It's a chicken/egg thing. Win and you get supporters. Get supporters, you get money, you get better coaches, you get wins. It feeds off itself. The question that we have always had was... How do you get that cycle started? You DEFINITELY need a competent AD (because of the level we are at, we won't be able to keep coaches we want for long... stAte is a model for that), and that is DEFINITELY an issue... But how do you kick start it? I long hoped that the move to FBS would do that, but it seems we didn't make a smart hire with Fran (or at the very least, kept him too long). So how do you do it now? My hope is Withers is the answer. Yes it has, and we are now the 4th or 5th largest university (public or private) in Texas student wise. It depends on if you count all of the online students at UTA to if we are 4th or 5th (A&M, UT, UH, UTA, TXST). Dr. Trauth said at UTA Cats Caravan that we are also now 7th in the state public universities in research expenditures. I believe Texas State will be R-I within the next ten years unless the university really stalls. Yet the small school mentality exists. I think part of it and rightfully so people are concerned about costs. Texas State costs more than UTA. 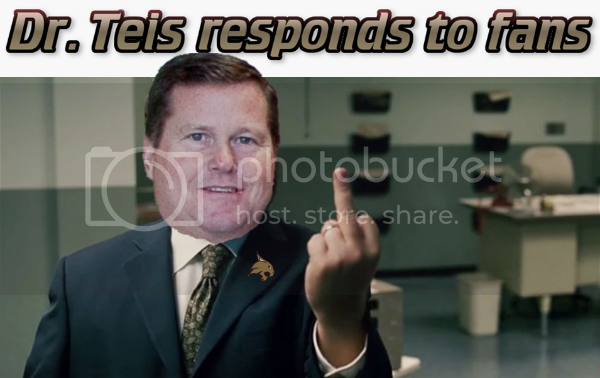 More fees and a DI football team makes TXST more expensive. we've been the 4th or 5th biggest since 91, at least. relative size is irrelevant. i'd rather put the brakes on enrollment and focus on quality for a while. San Marcos is landlocked so most of the future development will be in Round Rock for the time being. The Ingram Engineering building and Strahan Coliseum are the last two major developments in San Marcos for a while. I also hope things can slow down. I am so tired of the construction.